AM14U Family Horizontal Battery Mount Kit - AndyMark Inc. This battery tray mounts perfectly into the AM14U family of chassis. The bungee then secures batteries into the tray. Multiple mounting holes are available to mount to more than just the AM14U series chassis as well. Keep your battery secure and safe during those sudden hits. This is a great battery mounting solution if you can spare one of those two particular bits of volume! We used it in 2015 ad 2016. 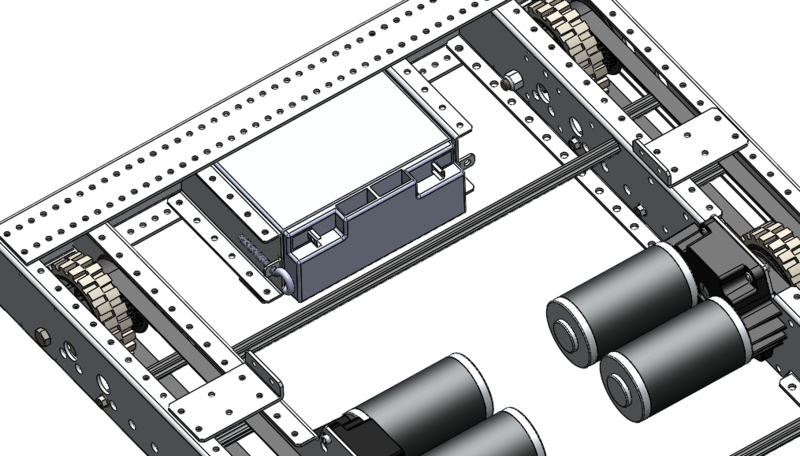 In 2017, we did a half-chassis (4 wheels) and wanted to keep the lower rear clear for a gear pickup, so we did a different battery solution.